Any space with ample light and access for watering and fertilizing is appropriate for container gardening, including a window sill, patio, doorstep, or rooftop. One advantage of gardening in containers is freedom from soil-borne diseases, insects, nematodes, and poor soil, all of which threaten plants in traditional gardens. With new technology, special varieties and innovative planting systems, you can now grow almost any vegetable, herb or fruit on a deck or in a small corner of your yard or deck— even producing more than if you planted them in a regular-sized garden. Never have been used with products toxic to plants or people. A wide variety of containers can be used including hanging baskets, clay or plastic pots, barrels, trash cans, milk containers, and bushel baskets or wooden crates lined with plastic punched with drainage holes. Even drain pipes and cement blocks have been used to grow vegetables! When using wood products, it is important to avoid those treated with creosote or pentachlorophenol (Penta). These treatments are toxic to plants. Containers that drain poorly can mean the failure of a container garden. Always be sure there are plenty of drainage holes in the bottom or along the sides of the container. It is a good idea to raise containers off the ground with slats or bricks to allow excess water to drain freely. As for container size, there are no hard and fast rules to follow. A general guide is to use small containers (about 1 — 2 gallons) for lettuce, spinach, mustard, peppers, radishes, green onions, carrots, beets, broccoli, beans, and dwarf tomatoes; use medium containers (about 3 — 10 gallons) for eggplants and for larger crops of any of the vegetables listed above; and use large containers (greater than 10 gallons) for cabbage, brussels sprouts, cucumbers, squash, and tomatoes. For most vegetables, starting with transplants will be faster and easier than seed. It is possible to give a plant maximum sunlight or to avoid damage from rough weather by moving it to a different location when necessary. Remember: larger pots will be quite heavy, especially after watering. Use dollies or platforms with wheels to move them. A good alternative, but rather expensive, are soil-less mixes. Soilless potting mix helps to insure your potted pretties will flower and thrive all summer long. There are many peat-based potting mixes available that do not contain any soil. They are composed of mostly peat moss with vermiculite and perlite added for porosity. Most will also have some fertilizer added to provide nutrients. They are very clean to handle. They are ready to use straight from the bag. If you use these soilless mixes, remember that they should be fertilized with a complete plant food regularly. Also, these mixes should not be used as is for cacti and succulents because they retain too much water for too long. Mix these ingredients together and you will have a clean, porous, moisture retaining, nutrient filled potting soil. By diluting the packaged potting soil with the peat moss and perlite, you will also reduce the excess soil salts that I mentioned above. Including garden soil in your potting mix is risky because it is too heavy and probably contains bacterial and fungal pathogens that can infect plant roots. Watering is very important. Containers dry out quickly, especially in full sun and wind. Clay pots, due to their porous nature, allow additional evaporation from the sides. Pots should be watered thoroughly until water runs out the bottom. However, the pot should not be left standing in water. Soil should be checked for moisture at least once a day, and in hot, dry weather, twice a day. Plants should be watered if the soil is dry an inch below the surface. Excessive watering can be as fatal as too little because there will not be sufficient oxygen in the soil for the roots to absorb. Often, premixed, packaged soil includes fertilizer. If this is the case, plants will not need additional nutrients for 8 — 10 weeks. After this, use a water-soluble fertilizer every 2 — 3 weeks. Always follow the recommended rates to prevent fertilizer burn or possible death of the plants. Vegetables grown for their roots (beets, carrots, and radishes) will tolerate partial shade, as will leafy vegetables. Don't overlook the tops of beets as a delicious green. Most other vegetables bearing fruit require at least six hours of direct sunlight a day. Many successful container flowers are either annuals or perennials—they either undergo their full lifecycle from seed in one growing season as annuals or they bloom in the second year and last for a few years as perennials. 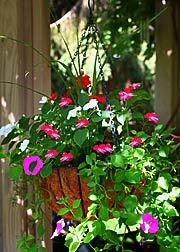 Annuals such as impatiens, marigolds and petunias add cheerful color to any setting. Petunias, for example, thrive in almost any type of container and are easy to grow, though they do not love intense heat every afternoon. Zinnias, however, succeed in hotter climates, and you can even purchase the Thumbelina variety. Grow vegetables that take up little space such as carrots, radishes, and lettuce, or crops that bear fruits over a period of time, such as tomatoes and peppers. Dwarf, miniature or patio varieties often mature and bear fruit early, but most do not produce as well overall as standard varieties. Such ornamental vegetables as red kale, mustard greens, chard, peppers, leaf lettuce and eggplant are grown as much for their color and texture as for their taste. You can also mix vegetables with flowers. Evergreens also make for year-round interest. Alberta Spruce are well suited to year round container gardening. The amount of sunlight that your container garden spot receives may determine which crops can be grown. Generally, root crops and leaf crops can tolerate partial shade. Vegetables grown for their fruits generally need at least five hours of full, direct sunlight each day, but perform better with 8 — 10 hours. Available light can be increased somewhat by providing reflective materials around the plants, such as aluminum foil, white-painted surfaces or marble chips. When given the proper care, a container garden can be every bit as satisfying and enjoyable as a traditional one.